Award Winners at Annual Membership Dinner! Each year Greater Riverview Chamber of Commerce (GRCC) is proud to present eight awards to very deserving members during their Annual Membership Dinner. The awards include the Businesses of the Year as well as individual recognition for members who have gone above and beyond for this Chamber and/or their community. Part of Greater Riverview Chamber of Commerce’s core values is “Fun” and with that in mind the Incoming President chooses a fun theme each year for this Membership Dinner. This year was no different with 2018 President Sharon Roush, South Bay Hospital, choosing “Get on Board the Member Ship” to create a cruise type atmosphere within The Regent. Master of Ceremonies, Jim Smeaton, Charles Rutenberg - Home Sales Tampa Bay, décor and music provider On The Move Productions, catering from Livy O’s Catering Co. and balloon displays from Inflated Expressions all contributed to the fun energy that was felt throughout the event. Another contributing factor were the many incredible table decorations done by our table hosts. Guests were asked to cast their votes for their favorite table prior to the official program beginning. Those votes were tabulated and this year’s winner was declared to be Superior Residences of Brandon Memory Care with Bill and Jill Andrew at the helm of their Good Ship Lollipop. A Hillsborough County Commissioners Commendation was presented to 2017 President Elijah Heath, Edward Jones, as acknowledgement of the outstanding achievements that Greater Riverview Chamber of Commerce realized under his presidency. Commissioner Stacy White was on hand to present this Commendation. In addition to Elijah turning over the gavel to 2018 President Sharon Roush, he also provided a glowing recap of the year’s amazing results and gave thanks to the Board of Directors, Ambassadors and staff for all of their support. Later in the program President Roush swore in the GRCC 2018 Board of Directors and encouraged the members to help the Chamber reach even higher accomplishments in the coming year. Thanks to a team of highly motivated raffle ticket sellers, the Chamber was able to give away $1,400 to one of the guests at the Coastal Catering tables. This actually makes the 2nd year in row for a Coastal Catering rep to walk away as the 50/50 winner. Special thanks to our top sponsors: South Bay Hospital, Brandon Regional Hospital, CenterState Bank, #Asphaltbabe, The Mosaic Company, St. Joseph's Hospital – South, Suncoast Credit Union, The Regent, Riverview Mortgage, Tampa Electric Company and Thatcher Properties. 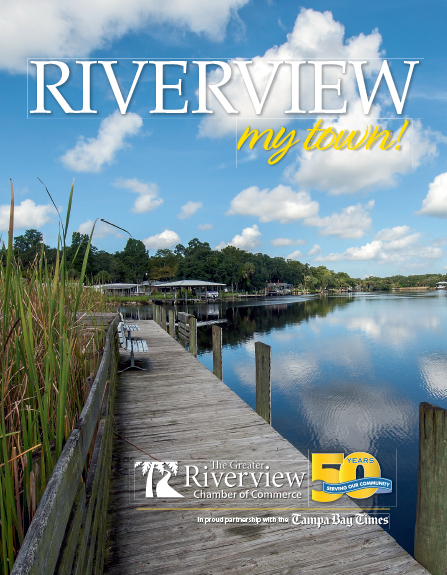 For more information on the Greater Riverview Chamber of Commerce please visit www.RiverviewChamber.com or call the office at 813-234-5944.